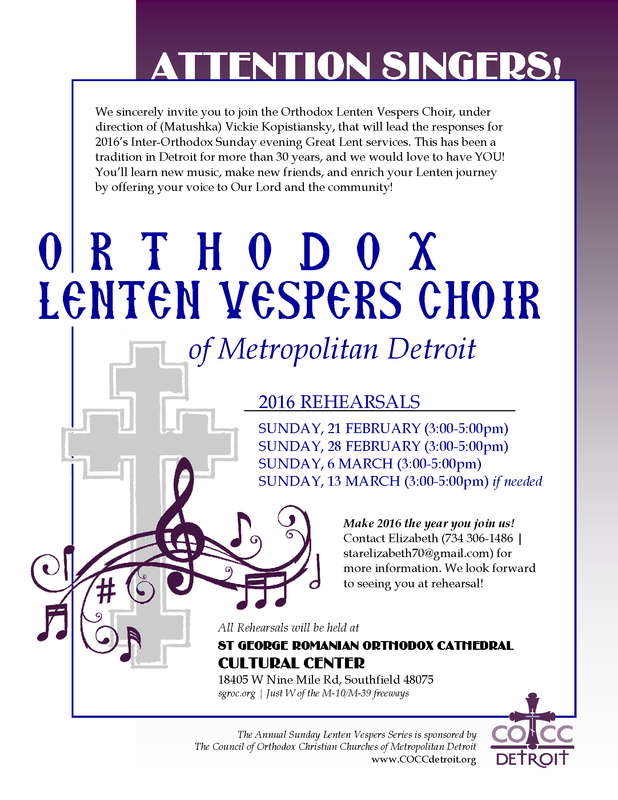 DETROIT, MI [COCC] -- The Council of Orthodox Christian Churches of Metropolitan Detroit (COCC) will again sponsor a series of Vespers services on the five Sundays of Orthodox Great Lent, at which the responses will be sung by the Orthodox Lenten Vespers Choir of Metropolitan Detroit. Singers from parishes throughout the region are invited to participate in the choir. "Please come and join us. We welcome new singers and our current singers," said Matushka Vickie Kopistiansky, director of the group. See the flyer for rehearsal schedule and details. For further information, contact Elizabeth at (734) 306-1486 or starelizabeth70@gmail.com. CLICK HERE to download the flyer in PDF format.